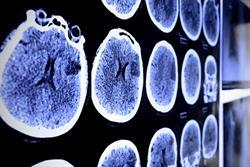 Improved prescribing of lipid-lowering, anticoagulant and antihypertensive drugs could prevent 12,000 strokes a year, a large study suggests. 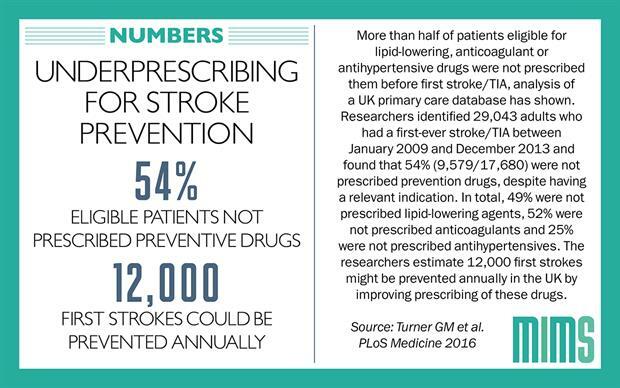 Analysis of primary care records from a database covering approximately 6% of the UK population has shown that one-third of all strokes or TIAs occurred in patients in whom prevention drugs were clinically indicated but not prescribed. Extrapolating their findings based on estimates of the UK population and stroke incidence, the researchers estimated that 41,405 first stroke patients are eligible for but not prescribed lipid-lowering, anticoagulant, or antihypertensive drugs annually. Considering the effectiveness of these treatments, the number of strokes that could potentially be prevented each year in the UK by optimal prescribing is estimated to be 11,823. Of the three prevention drugs, lipid-lowering drugs were the most commonly clinically indicated; over half of the people who had a stroke or TIA were eligible for these drugs. In some cases the prevention drugs had been prescribed but then stopped. Overall, 54% of patients not prescribed antihypertensive drugs when clinically indicated had previously been prescribed these drugs, compared with 14% for anticoagulant drugs and 30% for lipid-lowering drugs. Underprescribing of anticoagulants decreased from 58% to 45% between 2009 and 2013, but there was no reduction in the underprescribing of lipid-lowering or antihypertensive drugs during this period. The authors acknowledge there may be legitimate reasons for not prescribing stroke prevention drugs to people with clinical indications, such as bleeding risk with anticoagulant drugs or knowledge of a patient’s adherence to medication. They also note that their definition of underprescribing did not address patients’ adherence to medication or medication targets, such as blood pressure levels. However, evidence suggests GPs may overestimate side-effects and underestimate the benefits of stroke prevention drugs for elderly patients. 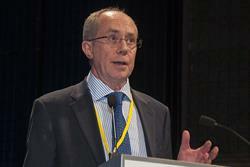 Lack of familiarity or agreement with treatment guidelines also reduces adherence to recommended prescribing practice. 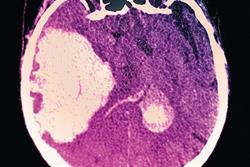 Given that stroke is the second leading cause of death and third leading cause of disability-adjusted life-years lost worldwide, the researchers' findings highlight that improving prescription of lipid-lowering, anticoagulant, and antihypertensive drugs is important to reduce the incidence and burden of stroke and TIA.